Yesterday I received an interesting phone call from Sven Spoormakers, ex-cyclist and active journalist. He was working on an article and he got intrigued about the blue colour of the Belgian national team jersey just like me. Guess what? 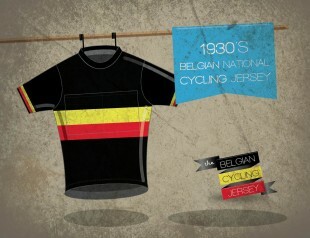 I am rather sure that some form of Belgian national cycling jersey is used in the thirties because of Tour de France director Henri Desgrange’s decision to allow only ‘national teams’ to participate in the race since 1930. I saw -and with me a few million other cycling fanatics- a tremendous race today. 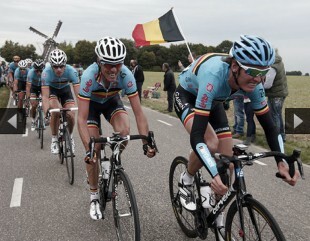 The light blue jerseys of the Belgian team were clearly visible throughout the world championship race in Valkenburg. The whole peloton had been watching the ‘smurfs’ all day. Everybody expected Gilbert to strike on the final climb of the Cauberg, nevertheless we were all dazzled by the explosive power he displayed. Did Alcyon bicycles impose the blue in the Belgian national team jersey? The French Alcyon cycling brand has been the major sponsor of some of the world’s best cyclists in the early years of cycling. Amongst them many Belgians. 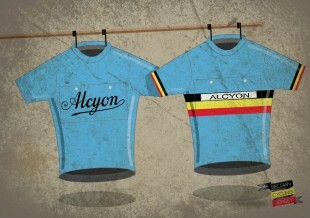 Did Alcyon have an important impact on the blue colour of the Belgian national team jersey?